In a world that moves faster everyday, it seems that change is the only constant and the diamond industry is no exception. Diamond dealers need to be ready for two important catalysts shaping the diamond industry. Consumer demographics and technology, as both will have a significant influence on the diamond market in the years to come. The first significant impact in the diamond industry is the shift of demographics away from Indian and Chinese consumers to more influence on the millennial generation. What is important about this shift is millennial consumers generally regard and value things differently than their predecessors. A typical millennial looks at a diamond’s uniqueness, carat and clarity, but also wants to know about the ethical and environmentally sound stories behind the origin of the diamond. The diamond industry is adjusting to this trend accordingly and it has become increasingly accepted to attach a story about the diamond’s journey from extraction to finished product for each piece of jewelry or even stone. Diamond certification, definitively proving the provenance of the stone will go a long way in showing that it is an ethical natural diamond. This would abate consumer concerns whether the stone was sourced ethically. The challenge facing the diamond sale market is the necessity for a consistent, reliable and cost effective way to identify and track diamonds as they pass through the value supply chain. Paper based transactions and the necessity for endless intermediaries relying on familiarity and trust made this an insurmountable task until recently. Mining companies are moving towards increased production while cutters and jewelry manufacturers as well as retailers are emphasizing design, branding, and the provenance story. What is missing is a shared technological diamond platform where all parties in the production process can communicate with transparency. GLITZKOIN is in the process of introducing a diamond blockchain platform that will reduce a lot of past inefficiencies by providing direct and transparent communication between buyers and sellers of diamonds. By leveraging diamond blockchain technology retail consumers will be able to track the entire history of the diamond, as it travels down the supply chain. Conscious consumers like the millennial generation will be able to verify the ethicality of the diamond or jewelry they are acquiring. 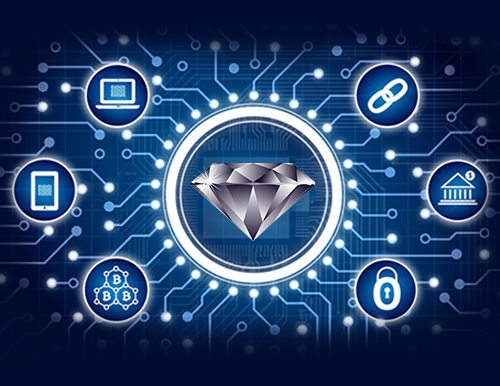 By implementing GLITZKOIN’s diamond blockchain technology platform we intend to reshape the future of how diamonds are bought and sold by reducing the need for many intermediaries and allowing retail customers access to diamonds in a more cost effective, secure, and transparent way. GLITZKOIN’s professional team includes diamond veterans who are familiar with every aspect of the diamond industry. We have also brought aboard the some of the best talent in blockchain and related technologies. This is a combination that is unmatched today and will remain so for a long time into the future. As the long-term outlook of the diamond market remains positive, this is great news for diamond dealers in terms of continued growth in China, India and with the millennial consumer. The question that needs to be answered is, if dealers are ready to embrace technological developments like diamond blockchain technology, which will make tracking supply chain tracking more efficient? We at GLITZKOIN think so.